Ten days on a different time zone, with a toddler, in 86% humidity, with two thirteen hour flights and some weird time difference jet lag vibes, gave me a little bit of time to think. Having little concept of time is freeing and yet aggravating: I never fully came off UK time and had friends traveling in NYC, LA and Europe at the same time as I was in KL. I never really knew what time of day it was or what I should be eating / wearing or whether I should be asleep or awake. The UK is so up on the gf food vibe I am beyond grateful. Trying to eat in KL eventually reduced me to tears when I could eat nothing other than plain rice or another caesar salad - but hold the dressing because that probably has some hidden wheat or barley in it. Being a coealic is hard. I hate to complain, there really are worst things I know, but when you're sleep deprived and can't eat either, it really throws you for six. After a birthday lunch for my grandma where I couldn't eat anything, I reached her apartment on the twelfth floor and my legs were beyond weak. The only upside was that one gin down and I'd be pissed. Swings and roundabouts, eh. Warm rain is still wet. I don't care who says it's better. It's not. I still got wet. 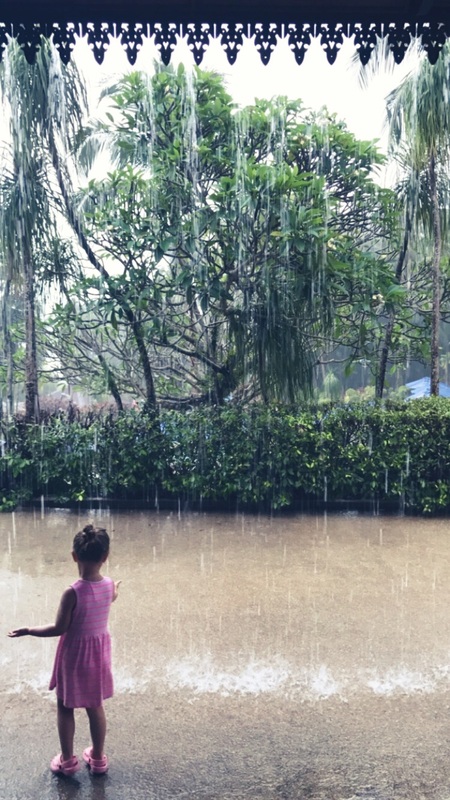 That said, if traveling with a small human, warm rain is probably the funnest thing ever and worthy of playing in. So. And landing in monsoon torrential downpours on a small tropical island sat with an unperturbed toddler has its upsides for your own slight fear of flying (see first point). It truly taught me that fear is learnt. Being able to have THAT photo (see above) of four generations in one room is above all else, priceless. I can't even tell you how awesome that felt and we made sure we got it as many times as possible. Attention to detail is everything. Malaysians will be the first to tell you that attention to detail is lacking in their country and I forgot how important that was to me. Traveling with a toddler reminds you to be consistently welcoming: Mini B said hello to everyone and I mean everyone; the guy moving the bags at the airport, the woman talking to the guy moving the bags at the airport, but it meant I did too. I think her blonde locks which are few and far between in KL also enthralled a lot of people. Going to a Hindu temple with your very western looking child when you yourself look very western but are in fact half Malay, and yet with all of your Malaysian family too, garners a LOT of attention. Going to a Hindu temple to take offerings as a thank you from family members that prayed for your good health when you were unwell earlier in the year: that'll hit you, quietly and in a moment of total non-sequita like when you're getting a massage at The Mandarin Oriental KL. Everything looks better in the sunshine. It's a shitter it rains so much in the UK. Although I wanted to "switch off" we all know that's hard to do and it irritated me that I couldn't. I storied occasionally but I didn't post on any social media. I liked this. I found scrolling on social media wound me up... And so I stopped scrolling. Meaning I've missed things. Soz. I really really enjoy routine. I suspected this but it's always weirdly comforting to be reminded. I adore my morning routine of feeding the cats, putting the kettle on, taking Lord Churchill out and then coming back to hot coffee. Adore. It. My anxieties are worst at home than when I'm away. I have less to pin it on when away, and no direct triggers. That routine I love - and crave - so much, is partly to blame I feel. This year has thrown up a lot I hadn't really given enough direct time to process, weirdly. The fact my hair is falling out again much like in the early days of motherhood, and the fact my sleep is so disturbed and not just because of jet lag, as well as newly found excema I never really had, tells me something is up. Having family in different continents means you've always sort of got half your heart and mind in one place, and the other in the place you call "home". I constantly thought about my freinds and family at home whislt sat drinking tea with my family in KL. And lastly, and I guess a sort of biggie; I am a bit lost with my work still, which I thought was just some weird funk but maybe it's more than that. Being home has all its advantages of being home, but without the family i've left behind in Malaysia. And whilst I was in Malaysia, I listened to this tune and thought of those that I love who were in the UK. It's probably one of my all time favourite songs.